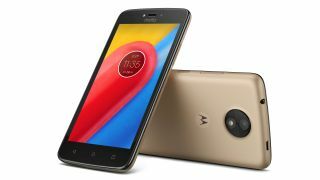 There are two new budget Motorola smartphones - say hello to the super affordable Moto C and Moto C Plus. The Moto C boasts a SIM-free price tag of just £89.99 ($97, about AU$150) and will be available in Latin America, Europe and Asia Pacific - including the UK - from sometime this Spring. With the Moto C you get a 5-inch (854 x 480) display, 1.1GHz quad-core processor, 1GB of RAM, 5MP rear camera, 2MP front camera, 2,350mAh battery, 4G connectivity, Android 7 and a choice of three colors: Metallic Cherry, Fine Gold and Starry Black. Meanwhile the Moto C Plus packs a higher-resolution 5-inch display, bigger 4,000mAh battery and a more powerful 8MP rear camera. There's also a 2MP front snapper, 1GB or 2GB of RAM, 1.3GHz quad-core processor and Android 7. The Moto C Plus price is set at £109.99 (around $130, AU$190). For those living in the UK, Motorola has confirmed that the Moto C will be sold at Tesco, Carphone Warehouse, O2 and Motorola.co.uk, while the Moto C Plus will be in Argos and on Motorola's website.